Vedana Spa, Pilgrimage Village, Hue, Vietnam. Enjoy a wonderfully warm Vietnamese welcome at Pilgrimage Village in Hue. Bridget McNulty did, and left relaxed and refreshed, and eager for more. Travelling in Vietnam is exciting and colourful and noisy� a feast for the senses. 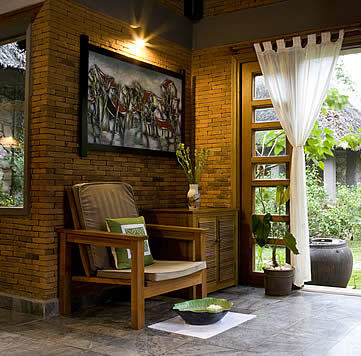 But sometimes the senses need to take a break, and that�s where the Vedana Spa at Pilgrimage Village in Hue steps in. The resort has been set up as a place of relaxation for pilgrims (or, more often, tourists) who arrive travel weary and leave feeling refreshed and revitalized. From the moment you step into the reception area, a traditional wooden carved area where you�ll be served hot mint tea and fresh sliced fruit, you�ll feel your shoulders relax and your mind start to calm. Choose from a range of treatments, everything from massage (Vietnamese, Thai, Detox, Swedish or Aromatherapy) to Reflexology, Body Scrubs, Body Wraps and the usual facials, manicures and pedicures. 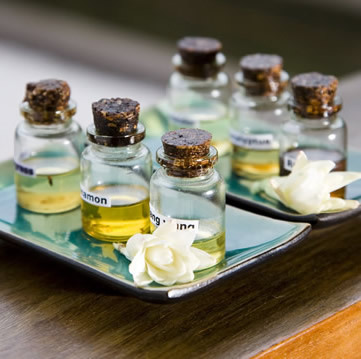 You can also indulge in a scented bath, filled with fresh flowers, milk and honey, or traditional Vietnamese herbs. Your most difficult decision will be deciding how to indulge yourself, what form your relaxation will take. Rest assured that no matter what you choose, you will emerge feeling like a much younger and more relaxed version of yourself. The treatment begins when your therapist leads you over the stepping stones across the pond to the salon or treatment rooms. From there winding stone paths lead to the secluded stand-alone rooms where you�ll enter a world of relaxation. Soft candlelight, soothing music in the background, the scent of fresh flowers in the air and a serene wooden carving of Buddha�s face softly smiling over the relaxing scene, as carved wooden doors, an elephant statue, and a high thatched roof remind you of your exotic location. Add to this the soft patter of raindrops, the gentle murmur of the waterfall in the pond, and the wind rustling the trees on all sides, and you have all the ingredients for a meditation in itself. When I stepped into my treatment room, I was greeted with the sight of a sunken bath filled with white chrysanthemums and red rose petals, an abundance of fresh flowers in a bath scented with essential oils, the perfect way to unwind after a relaxing treatment. 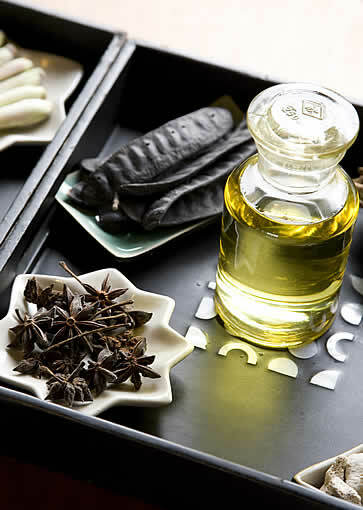 I chose the lavender aromatherapy oil for my Vietnamese massage, a 50 minute body treatment unlike anything I�d had before. It started off like a Swedish treatment, with warm oil being massaged, stroked and squeezed into my back, feet and hands. But then the Vietnamese part kicked in, as the �cupping� technique was applied � small warmed glass bowls suctioned onto the back in long strokes. A tingling sensation, but not unpleasant, and designed to take out all the impurities from the body. This was followed by a series of chopping motions, quite hard at times, but fantastic at releasing pressure. After weeks of travelling, my neck had stiffened into what felt like a hard plank, but after ten minutes of masterful work on it, the pain was gone, never to return. A magical feeling. The massage also included a divine head massage, and my first-ever face massage, as the therapist worked on pressure points on my face to release tension I didn�t even know I had been storing. I emerged supple and relaxed, and slipped into my flower bath with a soft sigh. There�s nothing like poking your toes out of a bath to find them adorned with rose petals to make you feel like a pampered princess. I lapped up the feeling. The Vedana Spa is open from 9am to 10pm, and also includes a separate Jacuzzi, steam bath and sauna area that is closed off whenever guests are in it, ensuring a private relaxation area (interrupted only be a therapist serving you hot mint tea and fresh sliced fruit). 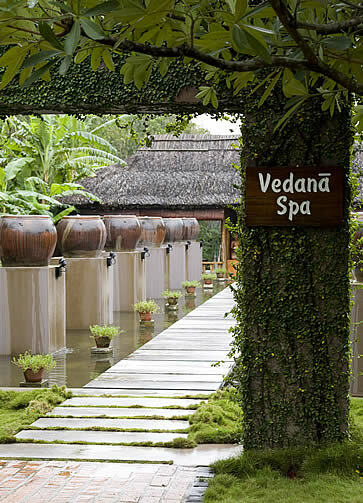 Anyone visiting Hue should make a trip to the Vedana Spa � to miss out on it would be to do a disservice to body and mind. And who would want to do that? Style Vietnamese serenity. It�s all thatched roofs, water features, and stone statues, softly lit by candles and joined together by stone pathways. Setting In the heart of Pilgrimage Village, Hue, a charming resort set in indigenous gardens on the outskirts of the city of Hue in Vietnam. Why you'll love it It�s all about the relaxation � you�ll be treated like a princess (or prince) and emerge feeling like a new person. 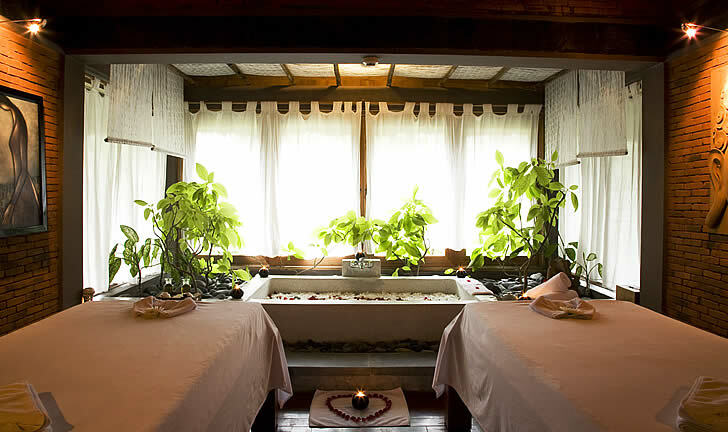 Good to know The treatment rooms are set up for couples, because Pilgrimage Village welcomes lots of honeymooners, so if you�d like a treatment, or a package, with your partner it�s all set up for you. A range of packages offer the ultimate in relaxation. Room for improvement Water on arrival and after the treatment would be very welcome � at the moment they simply serve tea, which is not quite as refreshing. 130 Minh Mang Road, Hue, Vietnam. How to Get There Fly into Hanoi International Airport or Ho Chi Minh International Airport, and catch a domestic flight to Hue Airport. From there, arrange for an airport pick-up from Pilgrimage Village (US$20 for 1 to 3 people, US$5 per person for 4 people or more). Alternatively, fly into Danang Airport, one and a half hours by airport transfer or taxi from Hue. Hi, I am travelling to Vietnam next month. Do you have any reservations available in the last week.